Many thanks3 for the COLOPHON4! Did you see the funny picture about it5 in the New Yorker6? I left a bunch of my copies of "Shadows"7 in Miss Hayes'8 room. Will you please send one of them to each of the two addresses given below? Don't forget to send me any interesting reviews. Document is one leaf, typewritten and handwritten on recto only. The conjectured date span encompasses seven days before the letter was stamped as received August 7, 1931, with a two day period allowing for mail from Grand Manan to New York City. Cather's essay "My First Novels (There Were Two)" appeared in the June 1931 Colophon. Possibly a reference to Louise Bogan's profile of Cather, "American Classic," in the 8 August 1931 New Yorker, which was accompanied by a caricature of Cather, although it is unlikely Cather would have received a copy by the time she wrote this letter. Hayes, Miss. 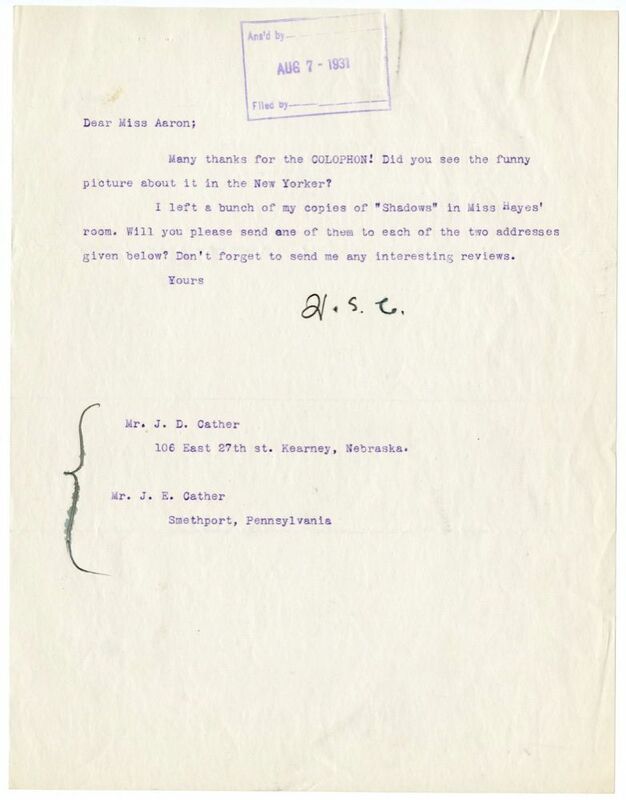 Employee of Alfred A. Knopf, Inc. Willa Cather mentions leaving her author copies of Shadows on the Rock (1931) in the office of Miss Hayes at Alfred A. Knopf, Inc., but further information about this person is not known.